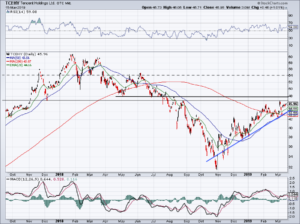 Home / Trading / Investors Wonder If Tencent Stock Is Worth Buying for a Potential Breakout? Investors Wonder If Tencent Stock Is Worth Buying for a Potential Breakout? TCEHY stock continues to move nicely. Will the rally stop dead in its tracks? Shares of Tencent Holdings (OTCMKTS:TCEHY) had a bumpy ride over the past year, as the video game industry worked through some tough headlines. TCEHY stock is still down more than 20% as worries over the gaming industry and the Chinese-U.S. trade war tamps the shares. However, Tencent stock has been on the rebound over the past few months. What’s driving it? For one thing, while the trade war persists, the rhetoric is softening. This is sending TCEHY, Alibaba (NYSE:BABA), iQiyi (NASDAQ:IQ)– the Netflix (NASDAQ:NFLX) of China — and a number of other Chinese equities higher. As well, while the gaming industry has been under pressure, one of the few bright spots has been Fortnite. The game is owned by Epic Games, which has is 40%-owned by TCEHY. Not only has this helped buffer the blow that other gaming stocks have suffered, but China is starting to come around on gaming as well. The country — which sparked a big decline in video game stocks during the fourth quarter — began banning and holding off on new video game approvals. It’s since relaxed a bit, although it’s far from an open market. These catalysts have allowed Tencent stock to rally from a $32 low in November to $47 now. After such a hearty move higher, investors are asking themselves if there’s still room left to rally. Alibaba is a well-known Chinese conglomerate, commanding a market cap of more than $472 billion. However, many do not realize that Tencent stock sports a valuation just a bit south of that, at $442 billion. Those who are somewhat familiar with TCEHY know the company has video game exposure. But they often don’t realize just how big of a company it is. Tencent has a huge social media unit, video subscriptions, online advertising and “other,” which includes units like cloud services and payment-related services. As with any large company like this, some of its businesses are underwhelming, while other are showcasing strong growth. For instance, last quarter, Tencent’s value-added services (VAS) business grew just 5%, as online game revenue fell 4%. However, social networks revenue jumped 29%, online advertising revenue climbed 47% and cloud revenue more than doubled. Some investors may have an issue with Tencent stock and its valuation. Making matters worse, discovering good analysis on TCEHY stock isn’t exactly easy. Despite the company’s large size, it has very few analysts covering the name. For instance, if you head over to Yahoo! Finance, there are only estimates from one analyst. They predict earnings of $1.26 per share, valuing the stock at about 36.5 times earnings. That’s not exactly cheap, even if their prediction calls for roughly 20% earnings growth next year. That said, revenue growth should be strong. The company generated $35.4 billion in sales last year and is expected to grow revenue 30% this year. With just one quarter left in fiscal 2018, it’s not too early to look ahead to fiscal 2019, where expectations call for 26.4% revenue growth. With this growth, TCEHY stock has a more palatable valuation. To be sure, TCEHY stock is not the most popular name in the investment world and, as a result, volume is far from robust. You’ll notice the “spotty” chart above reflects this situation in Tencent stock. But that does not mean it is without pattern. 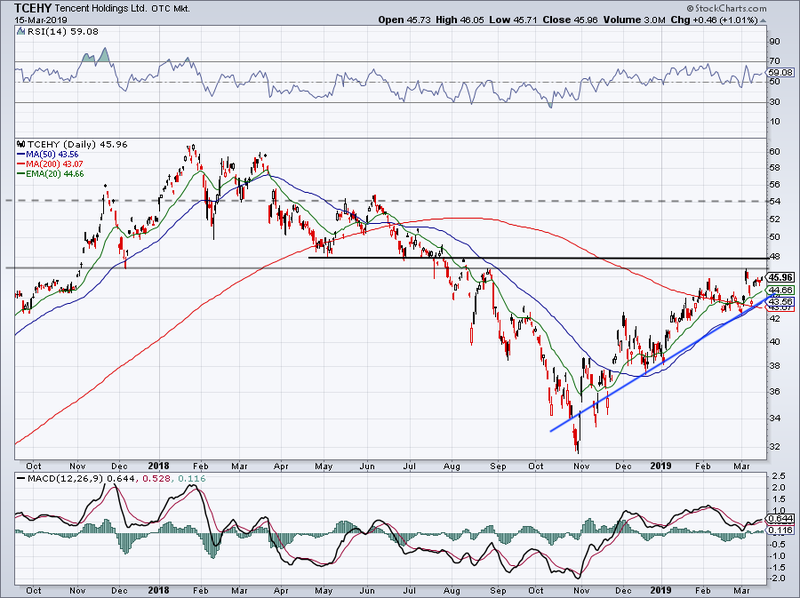 A look at the Tencent stock chart shows a very notable uptrend, as the shares knock on overhead resistance. $46 is one level of note, while $48 is the other. I would love to see the stock push higher, particularly above $46. If it can get above this level, it will remain on its path to $54, about 15% above current levels. Keep in mind, a pullback to uptrend support could shave a few dollars off Tencent stock. But so long as it holds, it should continue to do well. At this rate, investors can also use the 50-day moving average at the barometer for TCEHY’s uptrend. Above, and the stock is still okay. Below and we’ll have to re-evaluate. 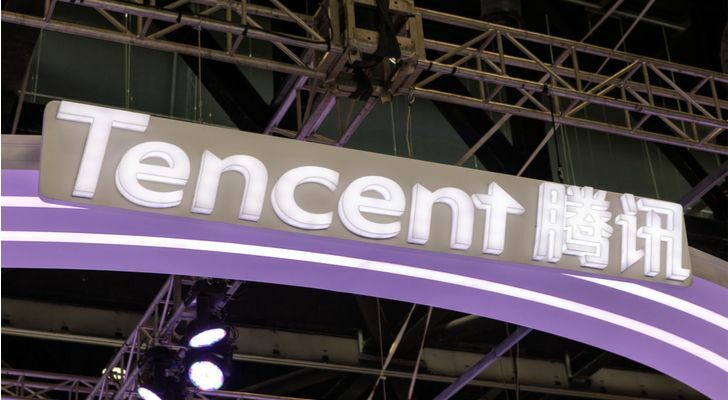 Article printed from InvestorPlace Media, https://investorplace.com/2019/03/investors-wonder-if-tencent-stock-is-worth-buying-for-a-potential-breakout/.